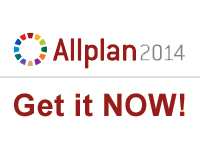 Allplan Engineering 2014 is being released! The international focus is represented by the support of Unicode (for special characters and Asian languages), new reinforcement type catalogues and representations. Internationally operating customers will appreciate these extensions. Support of “cloud” means that workgroup cooperation is now possible “online” and facilitates distributed and simultaneous working on projects (e.g. freelancers, home-office). BIM extended: with the IFC 2x3 standard, exchanges of model data - including reinforcement bars – are enabled; especially the exchange of reinforced concrete models with Scia Engineer opens new horizons. Parameterization: reinforcement bars and formwork may be generated through parameters which allow for fast modelling of more complex RC structures. Interested or in search of powerful RC modelling software? Try out Allplan Engineering r. 2014!